And so it is true. Property consultants’ laments about the property market consolidating and transactions slowing down have now been confirmed by the National Property Information Centre (NAPIC) in their first quarter numbers for this year. Although the findings are six months backdated as it is already August, the government agency’s figures are about as accurate as one can get about the state of the sector, down to how many transactions being done. Most states recorded overall drop in the number of property transactions for the different sub-segments, namely, residential, commercial, industrial, agricultural, development land and others. The trend of decrease is definitively evident. The president of the Association of Valuers, Property Managers, Estate Agents and Property Consultants in the Private Sector Siders Sittampalam says he is not surprised. 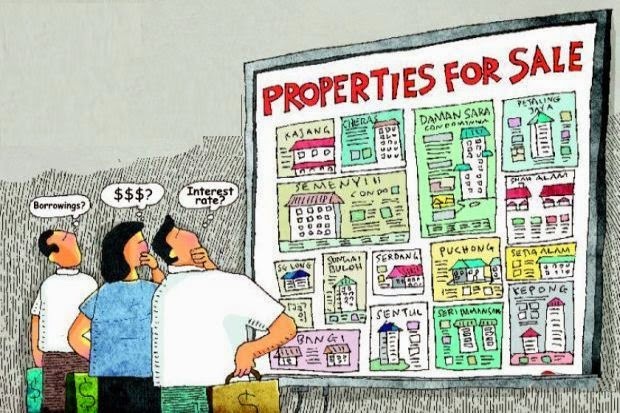 “It confirms what I said, that the Malaysian property market is consolidating. It is not a slump which is characterised by oversupply and declining prices,” says Siders. He is also PPC International managing director. Based on the NAPIC report, the temperature for Kuala Lumpur, Selangor, Penang and Johor is distinctly cool. In a nut shell, all four states recorded an overall drop in transactions with Kuala Lumpur seeing a 13.4% dive compared to the last quarter of 2013. Penang recorded a marginal 0.3% drop while Johor, which enjoys one of the most buoyant market in the country as a result of Iskandar Malaysia, saw a 4.5% drop in transactions. Selangor had a 10% drop for the period under review. Considering the interest in the property market the last couple of years, it can be concluded that this may be the first significant quarterly nosedive in the last four years. NAPIC is currently analysing the second quarter numbers. Siders is not too hopeful. “The market is not going to change a lot. The consolidation process is expected to remain for some time as there is no impetus. Positive economic conditions does not mean an immediate return of confidence in the property market. There is always a time lag,” says Siders. Residential transactions make up an average 75% of overall property transactions, according to the NAPIC numbers. 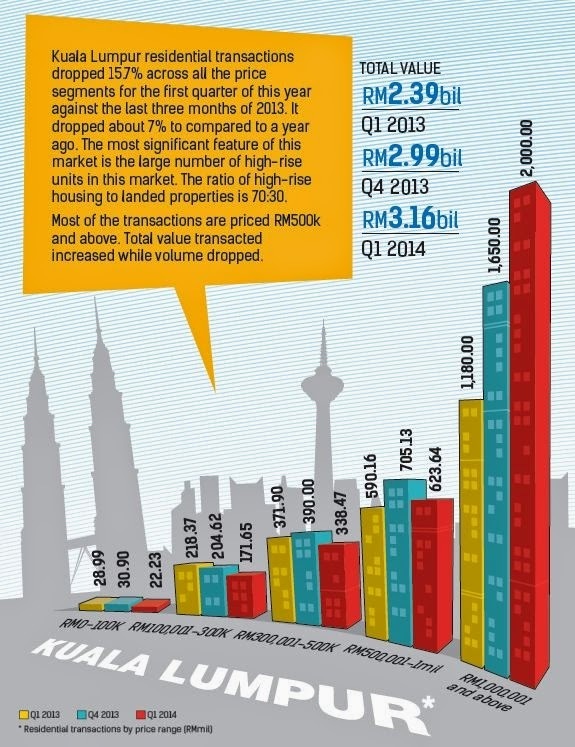 All four states recorded a drop in transactions with Kuala Lumpur deals decreasing 15.7% against the last quarter of 2013. The number of deals completed this year is also lower than a year ago, confirming grouses by real estate consultants that the market has been softening since a year ago. Still on the Kuala Lumpur market, the number of properties below RM300,000 is becoming increasingly limited, which explains why transactions for such properties are decreasing. Siders says there is “room for correction” in the overall high-end residential market. NAPIC research shows that the greatest number of transactions are for properties priced between RM500,000 and RM1mil. Overall, the total value of properties transacted dropped for all price segments with the exception of properties costing RM1mil and above. There are a couple of ways how one may read this - people are either holding on to their cash waiting for prices to fall or they may want to buy but have difficulties getting a loan. Raine & Horne executive director Lim Lian Hong says transactions have been slow since last year, particularly in the secondary market. “The drop (in overall market) may continue into the second quarter,” says Lim, adding that many properties have moved into the RM1mil and above segment. Condominium units dominate the residential sector with transactions accounting for 70% of the market compared with 30% for landed units. Increasingly, developers are resorting to building high rise as this is more lucrative. 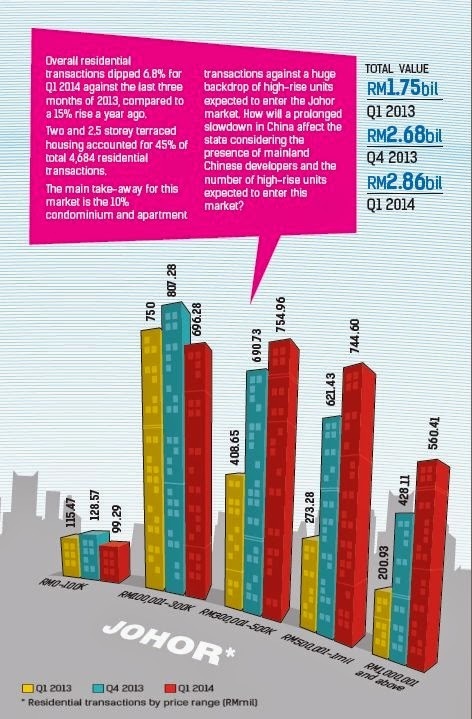 Condo units are being priced about RM700,000 per unit this year compared with about RM600,000 a year ago. Prices of double and 2.5 storey terraced housing continue to climb from an average of about RM700,000 a year ago to about RM900,000 in the first quarter of this year. A note of caution is needed here. These prices are average figures, not absolute numbers. 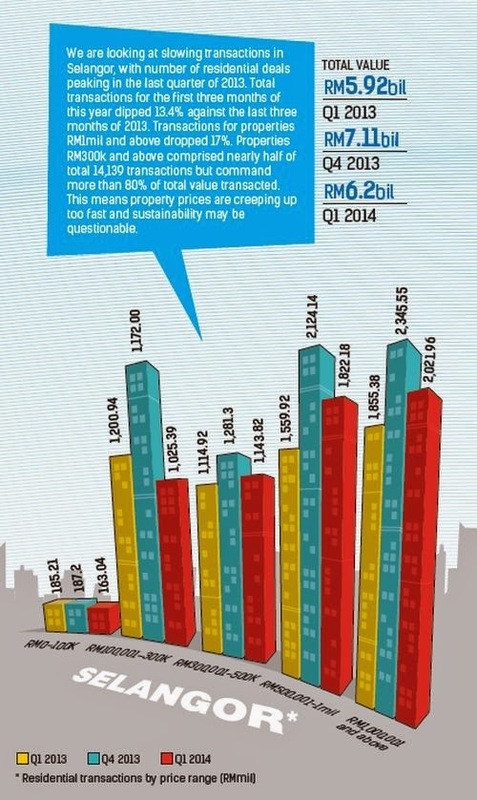 Commercial property transactions also showed a general downward trend in the city. The softening market is evident in Selangor’s residential market. “We are seeing a slowing down of transactions in Selangor,” says Lim, with transactions dropping compared with a year ago and against the last three months of 2013. Volume is concentrated in the RM500,000 to RM1mil range. The indication is that developers are offering housing within this price range. Most of the high-rise units transactions are concentrated in the district of Petaling although Selangor includes Klang, Kuala Langat, Kuala Selangor, Sabak Bernam, Gombak, Hulu Selangor, Hulu Langat and Sepang. The pricing of average high-rise units have also risen ranging from about RM280,000 a year ago to about RM330,000 for the first quarter of this year, an increase of about 17%. This has to be read with the big picture in mind as units in Petaling are considerably higher. The state of Johor continues to be “the most dynamic” as a result of the Iskandar-Singapore factor. While other states showed signs of slowdown a year ago, Johor’s property market rose 10.5% in terms of the number of volume with total value of transactions rising nearly 60% compared to a year ago. However, transaction volume and value have dropped 4.5% and nearly 35% respectively against October, November and December of last year. 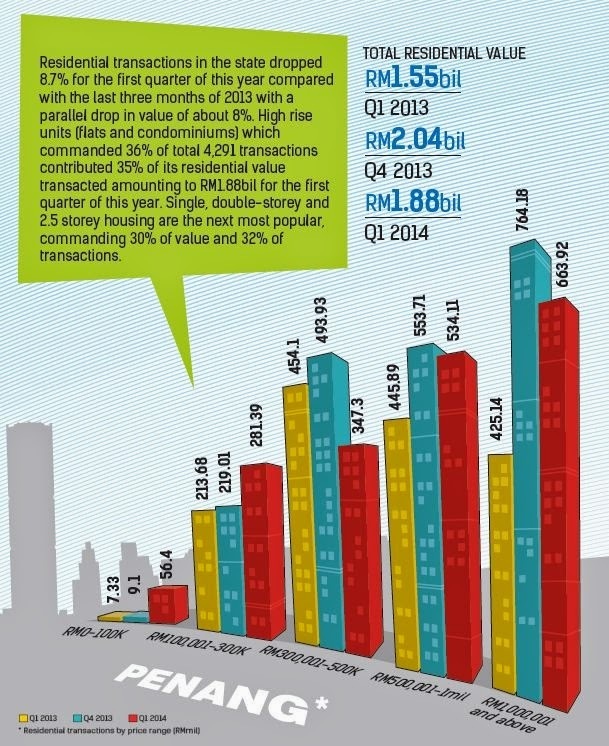 To put things in perspective, in the first quarter of 2013, Johor’s property sales totalled RM4.7bil. 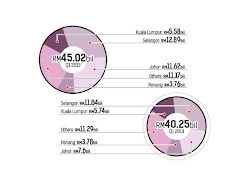 It leapfroged to RM11.62bil in the last quarter of 2013. In the first three months of this year, it dropped to RM7.6bil. Among the different sub-segments, land for development is the second most popular after the residential, an indication that local and foreign developers continue to like that market. The most popular type of housing continues to be two- and 2.5 storey housing and single and 1.5-storey housing with the number of condominium and apartment units on the rise in Johor Baru. The question is how will Johor fare in the event of a slowdown in China? Last year’s downward trend has continued into 2014, Raine & Horne Malaysia senior partner Michael Geh, based in Penang, says. “It is a general downward trend in terms of units transacted but prices remain firm,” says Geh. Across the different segments, the largest decrease is in the industrial sub-segment followed by the residential sector. Transactions of development land continue to remain robust, particularly in the Bukit Mertajam area and on the north east part of the island. Transactions for commercial properties continue to have its share of interest. The Penang market is dominated by both landed and high-rise units with condominiums contributing about a quarter to residential sales value. Most of Penang’s interest continue to remain on the island although there is growing expansion of the market on the mainland side, in the Butterworth area.